There's more to the quaint northern Indiana town of Shipshewana than Amish-made furniture, immaculate farms, and close-knit families. When a dead girl is found floating in a local pond, murder is also afoot. And Reuben Fisher is in jail as the suspect. Reuben refuses to divulge any information, even to clear himself of a crime Deborah is certain he didn't commit. I love a murder mystery, especially if it has been taken up a notch by placing it in an Amish setting. Callie and her friends are once again trying to solve a mystery. Reuben has been locked up in jail as a suspect in the death of an Amish girl. No one in the community believes Reuben could or would have done such a thing. 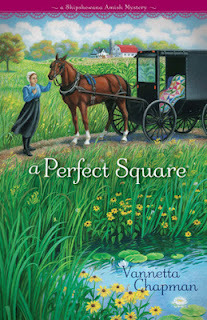 While Callie has her hands full with one mystery, an old Amish gentleman comes to her seeking her help. His daughter had disappeared during the 1965 Palm Sunday tornadoes. I remember those tornadoes and the feel of our house being lifted off of its foundation. Now Callie must try to make the connection between the two mysteries to solve them. I love reading books by Vannetta Chapman. It is a great blend of Amish and English, Romance and Mystery. The Christian aspects are not preachy. I can’t wait until the third book in this series, Material Witness, comes out this fall. If you want to see what Vannetta is up to go to her Facebook page.